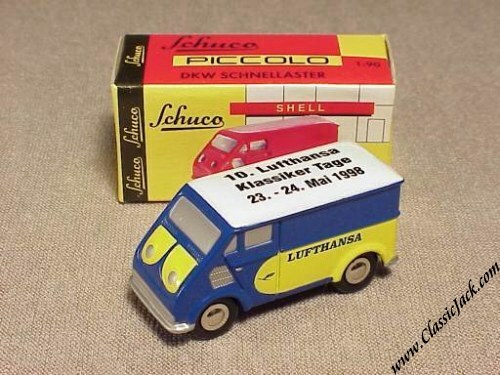 Schuco Piccolo DKW Schnellaster, Lufthansa Klassiker Tage. Issued in July 1998, this is an elaboration of the "Lufthansa" Schnellaster and was made for the 10th Classics Days in 1998. It represents a 1950's Lufthansa van in the well know yellow & blue color scheme and has an additional black print on the roof which distinguishes it from the "normal" Lufthansa version. It is a limited Edition of only 500 pcs.